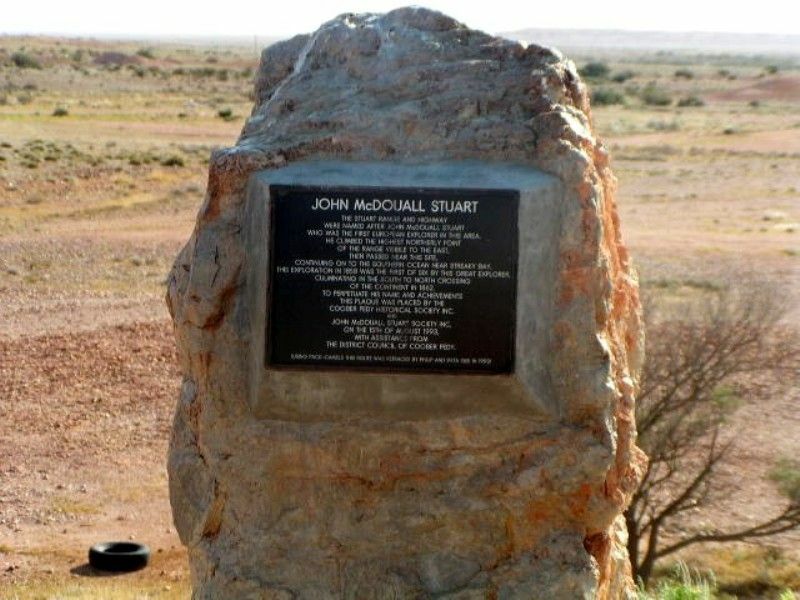 A monument commemorates explorer John McDouall Stuart. The vital phase of Stuart`s career began when he embarked as leader on the first of six expeditions into the interior. He left Oratunga Station near the modern day town of Blinman in the Flinders Ranges on May 14, 1858. He was accompanied by George Forster and an unnamed aboriginal youth, to search for new pastoral lands and minerals in the north-west of South Australia. He was also searching for a strange land which the aborigines called Wingillpin. Stuart took only six horses and provisions for one month - his instruments being a pocket compass and a watch. On June 26 1858, he made the European discovery of a large creek with `permanent waters`, in the arid region south west of Lake Eyre. He later named it "Chambers Creek" after his friend and future sponsor, James Chambers. This was the only major discovery on this expedition but it eventually proved to be `the key that opened the way to the centre of the continent`. Stuart continued to the north west but, near modern day Coober Pedy, he reluctantly turned to the south-west. Stuart did not realise the wealth of opal in the region, concealed beneath the peculiar flinty stones which were inflicting his horses with much suffering. 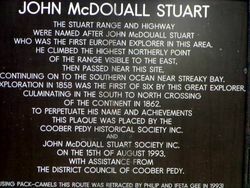 The Stuart Range and Highway were named after John McDouall Stuart who was the first European explorer in this area. He climbed the highest northerly point of the range visible to the east. Then passed near this site, continuing on to the Southern Ocean near Streaky Bay. Exploration in 1858 was the first of six by this great explorer, culminating in the south to north crossing of the continent in 1862. 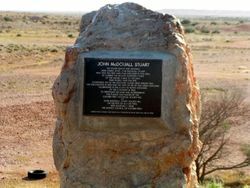 To perpetuate his name and achievements this plaque was placed by the Coober Pedy Historical Society Inc. and John McDouall Stuart Society Inc. on the 15th of August 1993, with the assistance from the District Council of Coober Pedy. Using pack camels this route was retraced by Philip and Jeeta Gee in 1993.